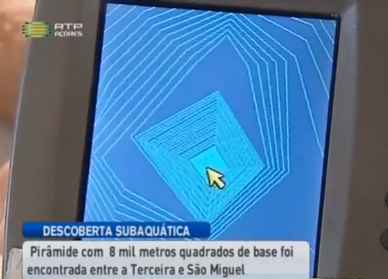 Portugese Television report the discovery of an underwater pyramid approx 60 meters high with an 8000 meters square base near the Bank De João de Castro, between the islands of Terceira and São Miguel in the Azores. The pyramid is aligned to the cardinal directions. That is a fascinating discovery . Why "nature made" was excluded as explaination? This is a youtube of the same video the OP linked but the following link has English subtitles. Because it doesn't fit their bias. These under water pyramid claims usually never pan out, they are most likey looking at mud volcanos. When I see pictures of blocks then I will believe it. The discoverer said in an interview to RTP Açores (which is the interview on the youtube video) that we had already given the coordinates to the regional government. Another Portuguese news site states that the matter will be investigated by the government with the help of the Portuguese Navy. Oddly enough, recently there was another discovery in Azores where archeologists found what seamed to be prehistoric artifacts in one of the islands. The matter is still under investigation as far as I know but if it is confirmed it would raise a big question of who were in Azores before the Portuguese. Maybe Phoenicians? It seams there are some evidence of Carthaginian presence in Azores and that is a plausible scenario. But it the artifacts are indeed prehistoric then this option is ruled out. If it is true, how could the prehistoric man arrived o Azores? Location:The Glorious America Union Federal Socialist Workers Paradise New York. Lets hope they will send robotics down to map and analyze the structure, who knows what else lies in the murky depths. Usually the story will die out, because it will turn out to be nothing special. I believe this is the first and last time will read about it. Yeah, right, and Roswell was a weather balloon! One has to wonder, at a height of only 60 meters (196 feet) and 2000 meters (6561 feet/1.24 miles) on a side what makes this a pyramid by any meaningful definition? If a perfect square then the base length is 89.44 meters or 170.84 AE cubits. Its slope would then be around 53.3* (very close to the slope angle of G2). Okay, I read it wrong. So we're talking about something 293.44 feet on a side, 196 feet tall and with a flat top. Still, what validates this is a pyramid and not a hill, sonar scans don't return perfectly sharp square angles even for the terrain below it like is shown in the OP. Nor is there any geological formation near the Dom de Joao de Castro Reef (its name on Google Earth) that is within 40 meters/131 feet of the surface. Did you all notice that the "Pyramid" is actually "sitting" on top of something like a mountain/hill ?? check the elevations of the contours at the start of the video with english subtitles. How far under the surface is the top of that thing? The water there must be terribly deep if it is a pyramid sitting on top of a hill or mountain and yet has never been discovered before now. No coordinates. And having gone through several bathymetric maps of the area between Terceira and Sao Miguel, and particularly around the Dom Joao de Castro Reef, nothing shows up even remotely close to the 100 meter below sea level base line for whatever this alleged pyramid is sitting on. It's claimed to be within 40 meters of the surface. Why do you sign every post when its written over your avatar? So, approximately within 131 feet of the surface. Whew; that's deep. Indeed. The last time the sea level was at the base of this structure was 15,000 years ago. Assuming it is a manmade pyramid, it is unlikely that it would have been built at sea level (most pyramids are built on hills/mounds). 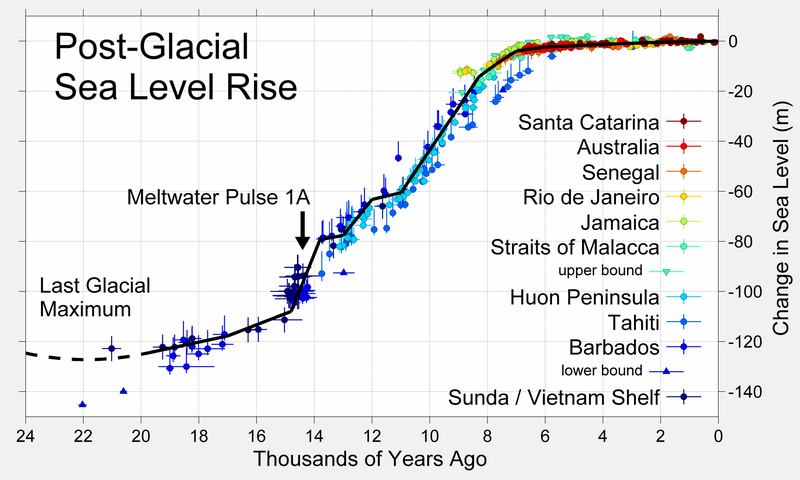 This means the sea level could very well have been lower still. If a further 20m lower then this would date the structure to ca.19,000 BP. Assumptions aside, since I'll wait to see if anything pans out regarding this, the bigger question IMO is why doesn't an area that's alleged to be only 100 meters below sea level show up on any bathymetric maps in or around this location? The highest point between Terceira and Sao Miguel is the Dom Joao de Castro Reef and it's still 1400+ feet below sea level. It's really interesting, even if it isn't a real man-made structure. I loved learning about the ocean's ebbs and flows and the rise and fall of sea level, so thank you very much for that. It's good to know that when it rises, it also does go back down again, and visa versa.